That's a very good point, I didn't think of that. My sincerest apologies, Magmafire. I hope that you didn't take offence or anything either, it was just a harmless bit of fun. I've edited it now, so that should foil any plans that anyone could hatch in the future. If Buzz and GreenRangerForever could edit out the old image from their previous posts, that would be appreciated. You've got to point me to where you got that SPD font from. I took it from one of the Zyu books actually, sir. But hey, afterall, your work is so badass that it could be taken for the actual props, lol. It's all good. No worries. I've seen it happen before with the ebay stuff, some times the pics end up there, that's why we need to be careful, especially with newer merch that's just been released. We have a good community here so I'm not worried about someone here doing that, but maybe someone casually lurking whose not a member of the forums might do it. I guess if someone really wanted them for their own auction photos and is photoshop pro they can probably get around anything we do, but making them have to photo edit sometimes is deterrent enough. plus, sometimes these pics from RB will actually show up on Google image search, I noticed that a couple times. For a SL Extreme the Green Ranger sure is missing alot of simple detail. 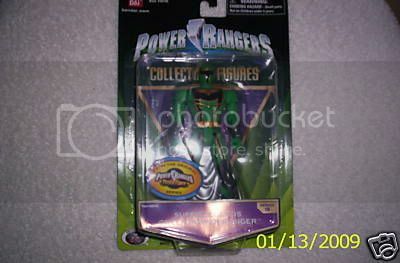 I think Ill just keep searching for the regular SL Green Ranger. Some of the missing detail can be touched up by a steady hand, I'm going to get one just so i can have a Dragonzord Summoning pose Green Ranger. if anyone is looking for an SL Green, Lord Zedd, or Gold Ranger, reply back to me HERE... do NOT PM me, heaven help you if you PM me. Anyways, I'm looking to get rid of them for $15 each, shipped. I take PayPal. Thanks. btw, I have TONS of references on this board if you guys were wondering, so yeahh, both MOC/MINT. Ohh, I know who you are now! I never played FF, but I found out Steve Burton(the guy I want to play Captain America) does his American voice. I saw an interview with him and saw a clip, and I never realized how much SB sounds like JDF. OK, back on topic now, sry bout that. I'm annoyed, I went to toys r us on my lunch break today, finally after putting it off and them closing early every time i got a chance to go, just to see if they may have gotten the extreme green ranger, and all they had is the red and black rpm, I just went to the toys r us in chicago last week and there shelves were pretty much empty so i expected the same here in louisiana, boy was i wrong, so i find an employee that works there to see if they have any left in the back, and i was lucky enough to find someone that knew what i was talking about, and he said some guy that worked there bought 2 of them, the only 2 they had, and they would get some more in 2 weeks. mean while wal-mart has removed there super legends zords all together and hasnt ut any extreme out at all, i know they didnt sell them all because i go there and i check every day (sadly), the 2 closest toys r us is 50 miles away in both directions, i hate living in a small city. Keep in mind a LOT of stores are doing resets (Shifiting product and the aisles themselves around) on their aisles, as such they're not putting a lot of stock out as it makes the jobs easier and go faster. Don't get your hopes up too high....this figure is a huge disappointment. I've yet to get a decent looking summoning pose. To do so, you're more or less going to have to balance the dagger in a position, where it is laying on the hands, but it won't actually be held. There is a white post that comes out of the Dragon Dagger (around where the normal buttons would be) and snaps into the figure's hand for a normal holding pose, but the hands are in completely the wrong place for summoning. I don't think you're going to be able to get the mouth piece of the DD up to the figure's mouth. Also, there are cuts in the figure to allow for posing. Under GR's right arm is an indentation that allows the arm to swing in over his chest. In any pose other than summoning, it is a huge eye sore. There are also cuts in the crotch to let the legs come in closer. On top of all of that, this figure isn't worth anyplace near $16.99. The plastic quality isn't the same as the basic line, and there are plenty of missing paint details. The base sculpt is probably the nicest we've had, aside from the problems. The helmet is great, and the body is a good, neutral styling, even better than JF's basic figures. The bad definitely outweighs the good, though. Luckily the legends line isn't a TRU exclusive and that $17 price tag will drop to about $14 tops when it's found at Wal-mart/Target. Was finally able to pick up the 3 figure set today during my lunch break and Im pretty happy with the Green Ranger thus far. Would of been better if the elbows were double jointed to help get the dagger in place better. Also the missing details can easliy be fixed, but they shouldnt really have to be fixed in the first place. 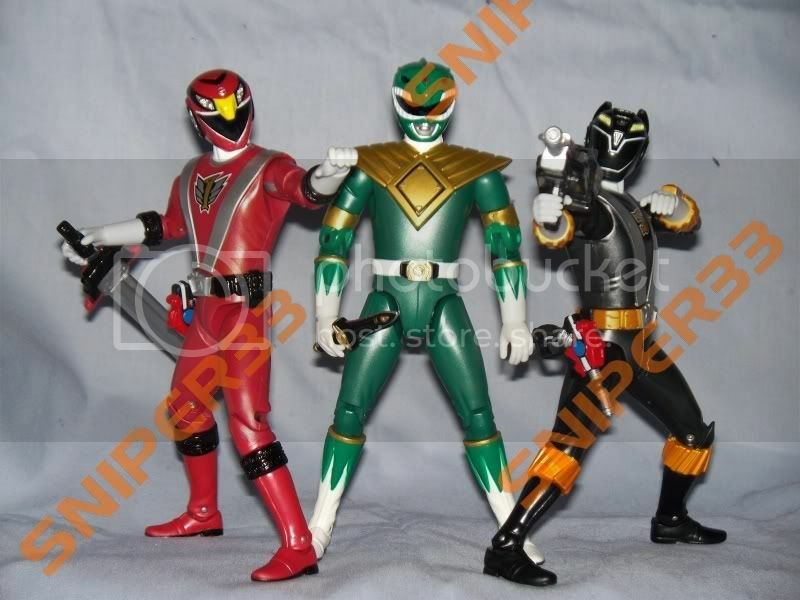 The dragon morpher looked alot better on the regular SL figure, but the look of this figure overall looks better to me. Cause like I said before, the body on it looks more like a man wearing the oufit then the other one did were all the muscles were popping out and such. Also like how the helmet and bodysuit are different shades of green to help give an illusion that the helmet is one material, while the outfit is something else (hopefully you understand what Im saying). And like others have said, it would be nice to see all of the original team in this form, but if they arent gonna include the 2 girls its almost pointless. OH and one other thing (lol), i didnt really like the fact that this figure came with a sticker of a completly different guy (think it was RPM green). There's also the chance of one of the remaining two being a villain. Give me Astronema or give me death. Nice pic. If I do get one of these besides Green, it'll be Red--the colors on the body and weapons make for a very dynamic looking figure. I've completed my galleries & reviews for the Green & RPM Red. I won't be buying any other Extreme RPM figures though.